Flight of Pollen is done and dusted! Now we’re raising the money to print 500 copies. Printing costs are not cheap, but I’ve done my best to get recycled materials. For instance, the counters are discarded insides of washers from Specialised Washers and Gaskets in Otaki (price = scones). You can watch our progress toward our goal, on this site. Please pledge and/or pass the word. Every little helps. 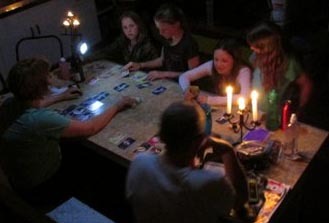 A week ago, friends gathered in our cosy fire-lit living room to trial the new board game from Jil Hemming. With anticipation for the unfolding journey ahead we aquainted ourselves with the pollinator discs we had been assigned and set out to pollinate our first flowers. At each level of complexity we learned the fascinating particulars of our pollinators – birds, insects and gecko and the peculiarities of each native plant. For instance, who knew that our famous honey-producing manuka had so few pollinators compared to that aloof giant of the forest, rata. We worked in teams as well as co-operatively to do the work of the wind, insects, birds and gecko. What a fantastic evening, and we look forward to playing again and sharing the game with more of our friends. 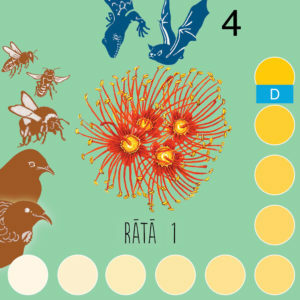 JiL Hemming, environmental game designer, talks about turning the science of pollination into the art of game play, for her new board game, Flight of Pollen. Here’s Karyn & Arihia setting up the Enviroschools tent at Kapiti’s Sustainable Home & Garden Show. Held last weekend in the glittering sun. 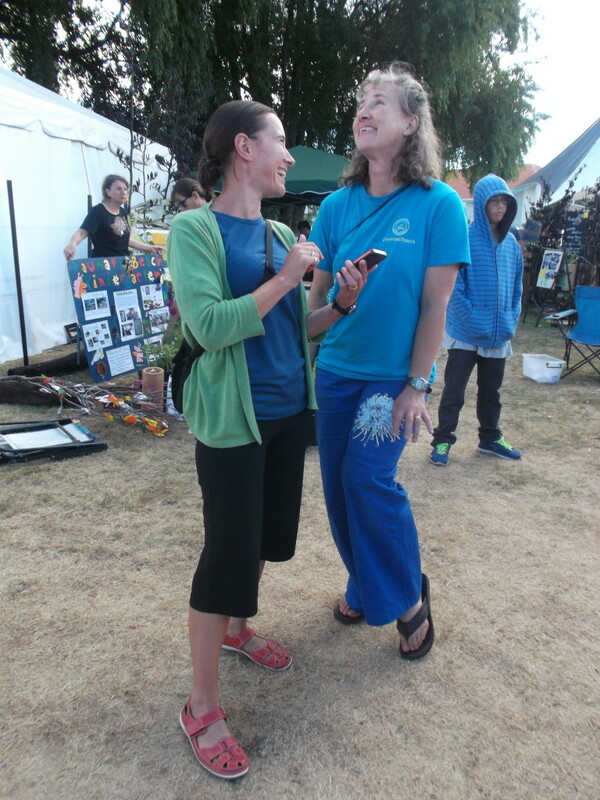 Among other events, there was Cloak of Protection being played inside (Enviroschools Wellington being my biggest supporter). The theme this year was ‘Bees, butterflies and bugs’. 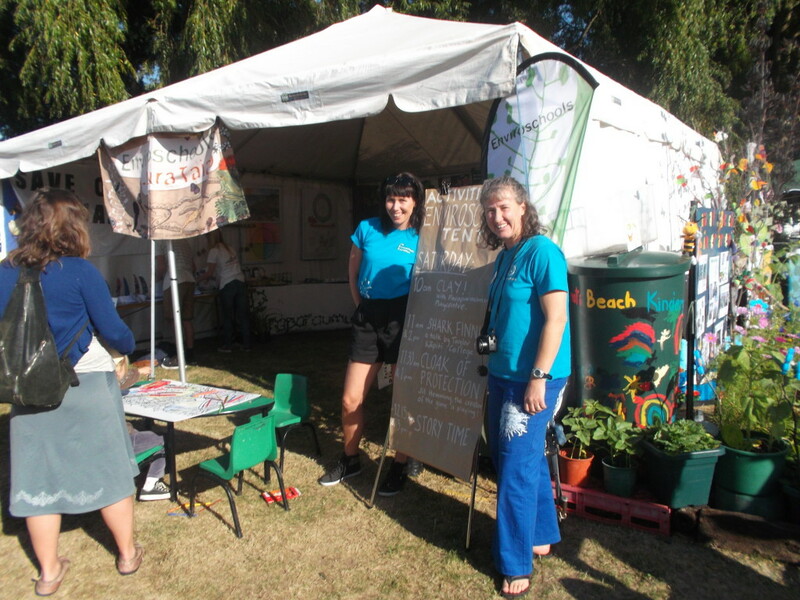 There were fourteen gardens from local Early Childhood Centres, Primary Schools & Colleges. At the centre of the school gardens ecosytems were alive! Bees joined us. Music wafted into our tent, chimes from one school, especially composed music from another. Here’s a pic of Karyn (with Natalie, the local water educator) at the end of the weekend. She’s dancing outside our tent, among the school gardens. Obviously we had a very good time!! Walking down onto Waikanae Beach last evening, was looking skyward for the flock of black dots of titi (sooty shearwater) that have been around. . .
. . .when my attention was caught by a massive seagull. Well, that was my first thought until it unfurled long wings & folded them in again. I began tracking giant bird foot-prints toward the water’s edge. Webbed & as big as the palm of my hand. Dwarfing the dog-prints. Closer – but, not too close – I found three birds distanced along water’s edge. They weren’t so keen on meeting me! One shuffled (on short-legs) into the water & landing a safe distance away, folded those giant wings into its body again. So – here’s what I could see from my (short-sighted) distance. Pale curved petrel beak, white body, black back. Giant body on short legs. Here’s a pic to toroa, who range throughout the NZ coast all year. Might have been??? the game has generated a life of its own! 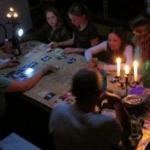 Home again & playing the game, last Saturday night with a bunch of primary-school teachers – I realized how much better the game has become since it first left my hands. Partly it’s the Hundredth Monkey Principal. * But it’s more than that! It’s as if Cloak of Protection has been played often enough, with real meaning, that it’s generated a life of its own! ie the game now appears to have generated its own force-field! One which is due to all of you. Scientists acknowledge that his can happen in a creative process. Rupert Seldrake in his book A New Science of Life says “the creative process can be seen as a successive development of more complex and higher-level wholes, through previously separate things being connected together”. I stand in awe & wonder. Quite often I get asked about the adzebill. Did this bird really REALLY exist? 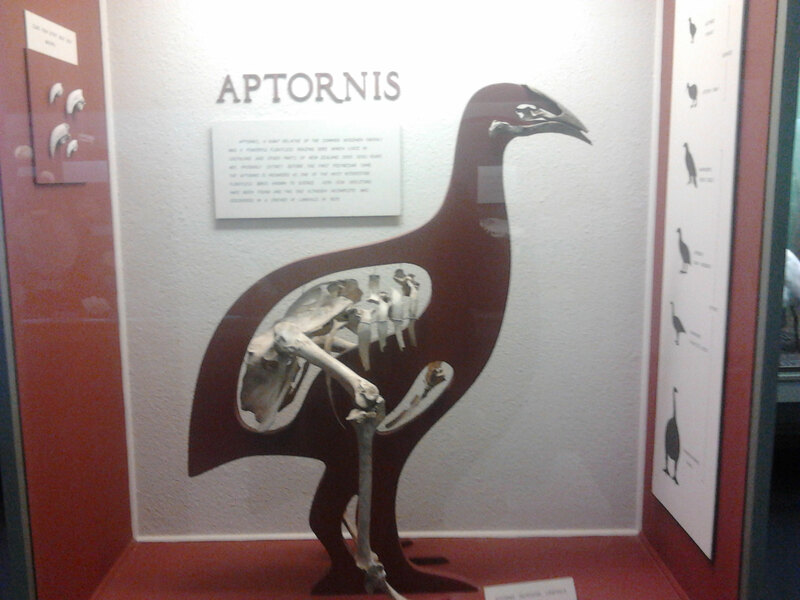 Oh yes – I say – I’ve seen the bones of one in the Invercargill Museum. So, this January I went for a hunt in their Natural History section. As you can see in the photo, it isn’t all the bones, but enough to put together a model. 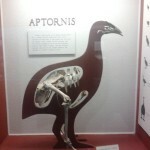 The label Aptornis, refers to its Latin name. I’ve added Morgan’s illustration below for a fleshed-out comparison. 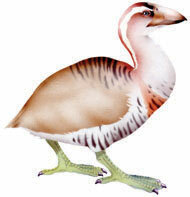 Adzebill were as large as a small moa, flightless, with a massive down-curved bill. In Cloak of Protection they are both extinct and predator. They were hunted by: kiore; dog; & the human hunter. In turn they hunted: tara-iti (fairy tern); tara (white-fronted tern); hoiho (yellow-eyed penguin); tutikiwi (snipe); kiwi; & whio (blue duck). 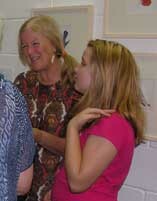 We had a fabulous evening with friends at the Mahara Gallery. Launched the game. Opened Morgan’s exhibition of illustrations for the game (he did 75!). 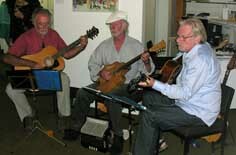 And Sasana played (Morgan is the centre musician).